Do you guys know Max California? If not, you should! She's a sewing extraordinaire, one of the coolest people around, & a total sweetheart. Max asked me to put together a tutorial for a guest post (read it HERE! ), & I couldn't have been happier to oblige. I love this chick & her darling family--& you will too, so go visit! So, for her, I put together a video on how to make a scrap-embellished tank top (which you saw a few weeks ago) from start to finish. The technique is pretty simple & can be used on ready-to-wear clothing as well. Everything you need to know is in the video. Have fun! Did I encourage you enough to send me photos if you make it? 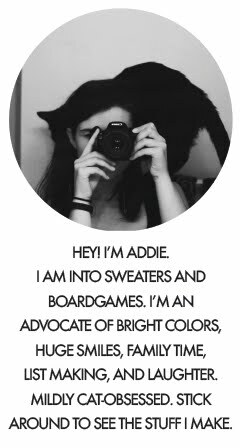 If not, here: addie@addie-marie.com. I'll love you forever! P.S. Last week, I also guest-blogged for Chaucee over at The Searched And Found... Go check it out!